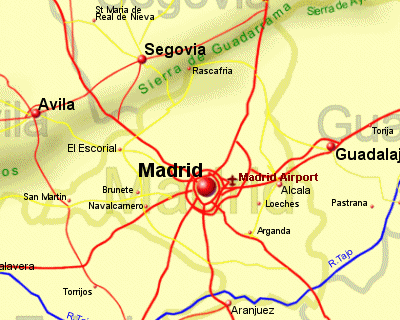 The region of Madrid has just one province and of course the capital city, Madrid. The capital is in this location for no other reason than it is the centre of Spain, making it around 300Km from the sea in any direction and on a plateau approximately 650m above sea level. The location results in a climate that can be very cold in winter and very hot in the summer. The city centre of Madrid does however have all the character, architecture, old alleyways and medieval buildings that you would expect in the capital of this country and has seen a lot of improvements in the last two decades. Madrid can be accessed by Madrid Airport.